The new "ladder design" crosswalks on Main Street at Harrison were installed yesterday. Photos: Bryan Goebel. 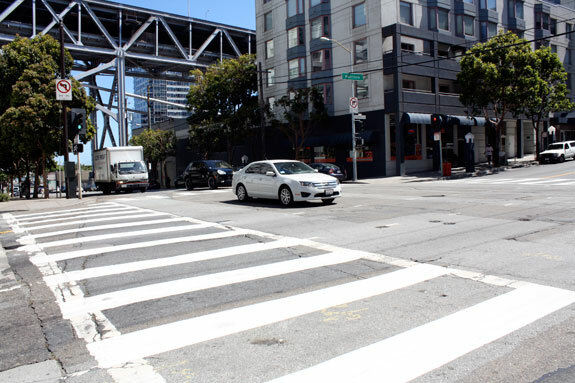 SFMTA crews have installed new continental crosswalks at the intersection of Harrison and Main streets, seven years after pedestrian advocates in Rincon Hill began lobbying the agency for changes following the death of retired SF State journalism professor Beverly Kees. 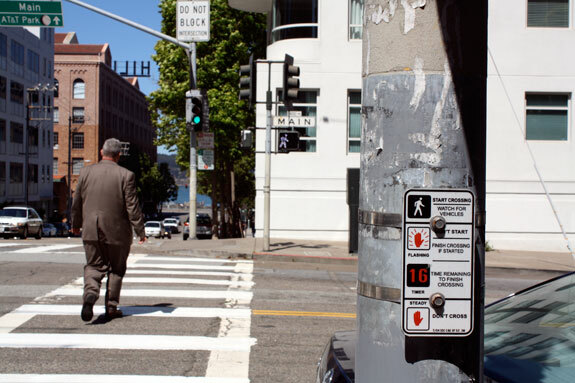 In addition, the pedestrian countdown signals have been timed to give pedestrians a four-second head start. As we wrote last month, Harrison and Main is the kind of place that’s so dangerous by design, it’s easy to see how drivers can lose their sense of humanity. Harrison serves as a four-lane westbound arterial (there is a fifth eastbound lane) that carries 12,600 drivers daily, most headed to the Bay Bridge. Drivers routinely speed and block the crosswalk. Since 2003, three people have died there, including Kees, and many more have been injured. 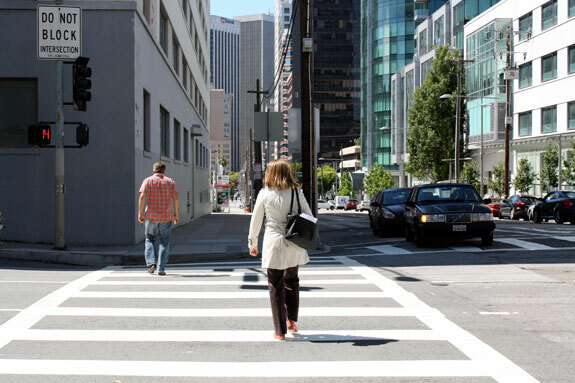 The crosswalk on Harrison Street. Great news. But looking at the top and bottom shots, I wonder why the original horizontal striping wasn’t freshened up at the same time..
gotta love the first shot, with the sign listing 4 step instructions for pedestrians to cross the street. why arent we posting lengthy signage at the intersection explaining rules of the road to the motorists like yielding to pedestrians? Serious question: why don’t we have these everywhere? The thermoplastic costs around $250 per lane to do a continental crosswalk, and it looks like this intersection is two five-lane streets, so I’d guess about $5K is materials and the other $10K is labor. I don’t even want to know how much of that 15k went to putting up four of those signs.